The Illinois Lincoln Highway Coalition completed an interpretive mural in Frankfort, the 23rd one in a series of more than 30 murals showcasing the history of the 179-mile scenic byway. 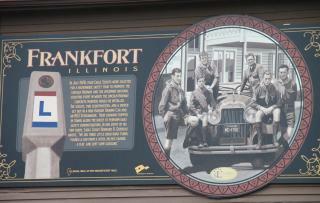 Motorists can see Frankfort’s mural on the Frankfort Township building, 11008 W. Lincoln Highway. It tells the story of Eagle Scouts and Scoutmasters who made a nationwide safety tour along Lincoln Highway in 1928, giving safety demonstrations along the route, “good road turns” and helping out where needed. The tour was a promotion of Lincoln Highway and the Scouts’ upcoming effort of placing Lincoln Highway concrete markers. To tie it in with the local community, the background shows the Folker’s Hotel — a Frankfort building in the 1920s — said Sue Hronik, program director for the ILHC.